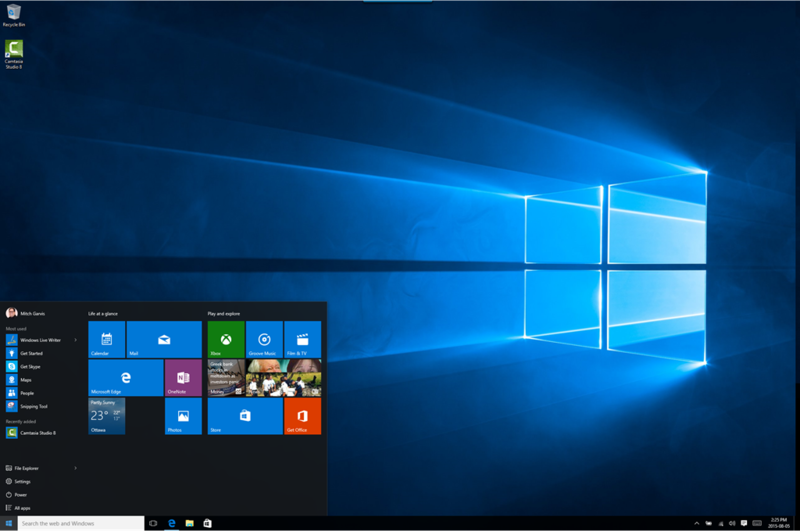 By the time you read this, we will be a few days into August, which means that Windows 10 started to become available a few days ago, and chances are this is not the first piece you are reading on Microsoft’s newest OS. Over the past few years Microsoft has been talking about a single OS for every platform. Windows X seems to be that. I don’t have an Xbox (or any other gaming console), nor do I have a Windows Phone (Sorry Cortana, I’m with Siri). However I do have four different installation types that I have installed on, and am glad to share. Because I have so many other portable devices, I find my (personal) Surface Pro 3 stays docked more than 90% of the time. It was the first of my devices to upgrade to Windows 10, simply because it was the device that I used for my Insider builds of Windows 10 beta. It was a seamless experience, and when the Start Menu (and not the Start Screen) takes up only a bit of real estate on the giant double monitors, it was great. I played with Cortana a bit, but I have not been home enough to really give her a go. My corporate Surface Pro is managed by the company, and as such upgrades and patches are blocked until approved by Tokyo. However I have a bit of a cheat… more on that later. 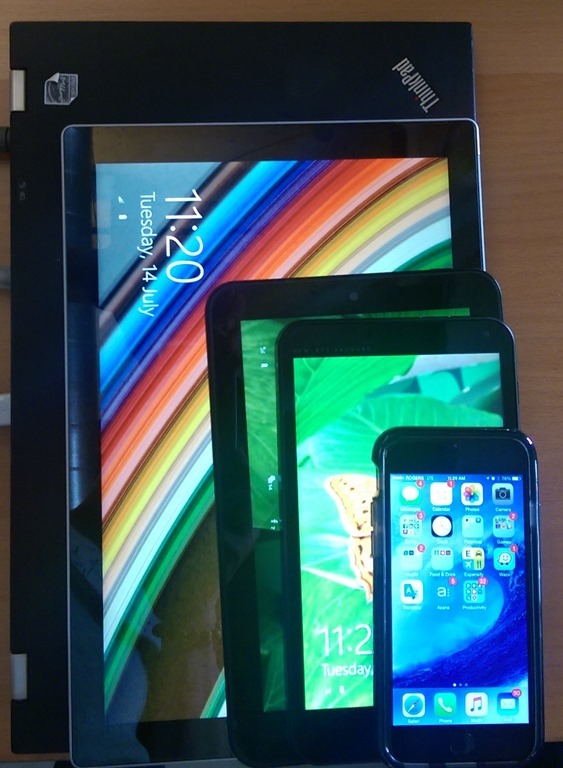 If you read my blog recently you know that I have a pair of HP tablets – the Stream 7 and the Pro Tablet 408. The Stream is still waiting its turn, but on Wednesday (GA Day) I had the 408 open on my desk when it told me the upgrade was ready. The process took longer than on my other devices – wifi combined with a slower Atom CPU – but it was seamless. I glanced over at it occasionally to see that it was still going, but it was only as the clock approached Bingo Hour (the time I need to leave my office to catch a train) did I get nervous. The upgrade finished at Bingo -2 minutes though, and I was good to go. Woohoo! If you have ever heard me discuss WTG you will know I am a fan, a lot more so now that I have discovered the Imation Ironkey W500. Fast, secure, and milspec indestructible. I will be writing a separate article on my Windows To Go experience… Believe me, I am happy with it… but mostly because I have my Ironkey USB key. I suspect that when I try it on the other devices that I had tried I will be just as unhappy with the overall experience as I was with Windows 8.1. Here is where I first noticed something that irked me: All of my Windows 8 Apps (now known as Universal Apps) were there… but my legacy apps (including Microsoft Office and Live Writer) were nowhere to be found. I am sure if I went looking through my Windows.old directory they would be there, but an Upgrade is supposed to be just that. Microsoft wants us on Universal Apps; I get it. When I worked for them they were very specific about reminding users that their corporate IT department can side-load corporate apps, and their deployment tools will already be set up for their legacy apps. Now I am Mitch Garvis, and I know a thing or two about Windows and deployment and installing. What about the 50 year old housewife who agrees to an upgrade because Windows Update recommends it, then finds out that all of her programs are gone? She probably doesn’t have a record of every program she used (many of which she bought on-line) and has now lost, if only because she forgot how or where or what. Fortunately most of the apps I need have worked the way they need to… one exception was Windows Live Writer, but with a little help from my friends I was able to figure out how to get that to work (see article). However let me give Microsoft one huge LEMON for not telling us that our legacy apps will be gone… and in some cases may not be recoverable. What should I do BEFORE I install? While Microsoft has made upgrading to Windows 10 (Windows OS X?) easier than ever, there are a few things that you should still do before upgrading. Back it up! Hello, haven’t you been listening for the last twenty years? If you don’t want to risk losing it, take a backup of your system… just in case. Make a list of the programs you have installed. Your Modern apps on Windows 8 won’t be a problem because in the worst case you can still go to the Windows Store and see a list of the apps you have bought or installed in the past. However anything else – the programs which weren’t installed from the Windows Store – are probably going to be gone. You may not want to re-install some of the programs you had on your old system… but making the decision to not re-install is different from not re-installing because you forgot it was there. Along the same lines, before you run through that upgrade go through the list of programs and see what you might have to re-download, or at least make sure you have a license key for/ them. Also remember that some application licenses track installations, and you might have to uninstall before being able to re-install. Have your drivers handy. If you have any known OEM brand there is probably a directory on your system with all of your drivers… c:\swsetup or something like that. Just to be safe, and especially if you have custom drivers installed, you might want to make a copy of the directories c:\Windows\System32\Drivers and c:\Windows\System32\DriverStore. If you forget, don’t worry… it will still exist somewhere in the c:\Windows.old directory that the upgrade will create. One of the great things about the age we live in is that we can dip our feet in the water without diving right in. If you are unsure if you really want to upgrade your system before you get a chance to try it out, most modern systems will allow you to create a virtual machine and install an instance on your existing OS without affecting what you have. Whether you do it with Hyper-V, VMware Player, or Oracle VirtualBox it doesn’t matter… just remember that the experience you will have will be that of a virtual machine, and you should test features and feel rather than performance. When you decide that you like it, then you can go ahead and install. Until you do, remember that what you have still works, and most of the features that are new to Windows 10 are great, but you have lived your entire life to date without them… you can go another few weeks. How do I know if my program will work? If you are an IT Pro for a large organization, you should be installing lab environments and running compatibility tests for everything you need. If you are an individual and are unsure if your applications or devices are compatible, there’s a site for that. The Windows Compatibility Center allows you to type in any software package and find out. So if you are one of those who bought Adobe Acrobat 7 and never paid for the upgrades, you can type that in to the tool and you will get this page. Now granted, there are a few different submissions for the same package, and you can also end up with this page. Obviously there is ambiguity, but at least you know that some people have said there are issues, so you should be careful. If, on the other hand, you want to know about QuickBooks 2012 Pro, you will see that nobody seems to have an issue (see page). However if you have any app or program that you are worried about and on which your productivity depends, I always recommend spinning up a virtual machine or Windows To Go key and see if it works firsthand. By the way, one of the areas around which compatibility has always been an issue come new OS time is printers and other devices. We have to recognize that the device manufacturers who made your LaserJet 4000n in 2001 are the same ones making modern printers today, and while they will probably get around to releasing a driver for legacy hardware eventually, their main responsibility (and source of income) is their latest and greatest. Once their newest drivers work on Windows 10 they will probably go back and write one for the hardware they stopped officially supporting during the Clinton Administration. I have several devices working on Windows 10, including my personal Surface Pro, my HP Pro Tablet 408, and my work/test Lenovo T420s (docked). Additionally, I have also created a Windows to Go (WTG) key on the T420s, which is really a combination of everything, and a computer unto itself… to prove that, in the middle of this very paragraph I saved my work, shut down the WTG on the Lenovo, plugged my USB key into my Surface Pro, and I am now working very happily in the same place on the same installation of Windows, but on a different CPU, monitor, keyboard, and mouse. That’s pretty cool; expect an article on Windows To Go in a few days time. My corporate Surface Pro 3 and my personal HP Stream 7 are both still running Windows 8.1. Why? The reasons for each are different; the Surface Pro 3 needs my company to get a license for Windows 10 Enterprise assigned to it (which I could easily get around by using my own license, but seeing as you probably just finished reading the paragraph called Caveat Installer a few minutes ago, you will know I have other reasons as well. The HP Stream hasn’t been upgraded yet because, like many of your computers, it is still waiting in line for the go-ahead. Incidentally, if you received an e-mail ostensibly from Microsoft telling you to click here to install Windows 10, do not do it. There seems to be a new ransomware going around – what this package does is encrypts your data and doesn’t give it back to you until you pay in untraceable Bitcoins. In other words, don’t do it… it won’t turn out well for you. As I walked away from my desk this morning with a couple of colleagues I said, out of the blue, that I was actually enjoying the Windows 10 experience. There are certainly things that I am not happy with, and things I haven’t yet figured out. However for the most part I am happy with it. It integrates better with my Windows Account Microsoft Profile than any previous iteration of Windows, it saves my having to redo all sorts of work on each device I use, and with few exceptions all of my apps run on it. If we assume that Microsoft spends millions of dollars trying to not repeat the mistakes of the past (notice the Start Menu is back), and learning from those mistakes, the user experience of Windows 10 should be exactly what the customer (you and me!) ordered. Should you upgrade? That’s up to you… as I mentioned in a previous article it is no longer my job to convince you to do so. However if you do want to, you will probably not regret it! ← Deal on the Stream 7! I had no issue with Office 2013. It worked the same after the upgrade. My only issue has been with Edge and losing all my favourites, but Edge has a run as IE, so my favourites are back. A bit of a nuisance, but liveable.